How can architects relate to digital media? What do developments in digital media have to do with architecture? And how should architects and urbanists relate to developments in new media? 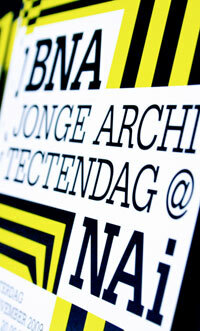 The Netherlands Architecture Institute (NAi) and Royal Institute of Dutch Architects (BNA) invited The Mobile City to address that question for the yearly ‘Day of the Young Architect’, on November 7th 2009 in the NAi in Rotterdam. This day was themed ‘the virtual’, and was organized as part of the overarching ‘connectivity’ cluster during the 4th International Architecture Biennale Rotterdam (IABR). We gladly accepted this challenge, since this very issue was one of the main reasons we founded The Mobile City two years ago. After all, as the boundaries between physical and digital spaces blur, this should have profound consequences not only for new media developers but also for those professionals who traditionally deal with physical spaces. We surely did not expect this to be already obvious for most architects. But the fact that only half of the audience raised their hands when asked by moderator JaapJan Berg whether architects should deal with digital media in their profession showed there is still some way to go. This report contains the main argument of our talk. But it also presents some additional reflections, and is an attempt to take our argument further than we did at the NAi/BNA day. We address the following questions: what position can architects, planners and urbanists take in their design profession vis-a-vis new media? Why should they bother with new media in the first place? What are the challenges they face? And what are future directions and chances for these professions? In answering these questions, we make a strong plea for an attitude of ‘critical engagement’. This posits architects should neither ignore nor completely embrace digital media. Rather we would urge them to think of themselves as designers who primarily shape social processes, and only second as designers who shape spatial forms. Which social processes underly new commissions? What kind of activities, social interactions or exclusions should a new project encourage or discourage? How can these be shaped through spatial forms? And what roles do digital media play in this? We think architects shouldn’t just build an urban screen just because you can, or the Kunsthaus in Graz has one too. Rather they should start by asking: what kind of social processes do we want to provoke or hope to avoid? Can an urban screen indeed contribute to these processes or will it disturb them? What other disciplines do we need to invite to the table to meaningfully program an urban screen so that it goes beyond mere window dressing and indeed enhances the project? Now let us work out this argument in more detail. But first a small aside. Some might quickly object that our initial questions have already been superseded. After all, architects and urbanists have long embraced digital media in their professional practice. They have been quick to employ computers and other digital media technologies as instruments in the design process itself (computer-aided design), and to create new visualizations. Initially simply as an addition to- and replacement of hand-drawing and modeling. Later the processing power of computers was used to calculate new spaces that would otherwise not have been possible. This would lead to a second phase in the relationship between spatial design and new media, namely the creation of spatial forms that reflected the rise of the digital age. A new visual language emerged in spatial design that explored the semantics of new media. In addition, new media (and in particular ‘virtual reality’) were seen as a new spatial realm that could be shaped by a ‘virtual architecture’. Yet we believe a new phase has ushered in. This phase is characterized by increasing overlap and integration of digital space and physical space. Rather than being a separate realm of their own (labelled by terms like cyberspace, virtual reality, digital domain, and so on), new media technologies – and mobile media in particular – have become an inseparable part of everyday life. Internet-enabled mobile phones, GPS navigation, entry cards with integrated RFID chips, CCTV cameras, media facades, and so on are embedded in the urban fabric (see our 2008 conference text). We propose that this new phase impels architecture to relate to digital media in a new way, beyond merely using them as instruments, to represent their spatial logic in design, or to design for virtual worlds. We have seen three different attitudes towards the emerging hybrid city, that we will now briefly describe. Why wouldn’t architects and planners simply ignore developments in the field of new media? Arguably, new media developments and architecture operate at very different speeds. It often takes many years for an architect or planner to negotiate, design, and build, whereas the design of new media technologies is calculated in months rather than years. Further, the lifecycle of media technologies is often updated every few months, whereas an architect or planner traditionally designs for at least a few decades ahead, if not ‘for eternity’. Why think about how people use Twitter to organize their daily life and meet people, when the services may have ceased to exist or evolved into something completely different by the time the design for an urban square or university campus is finished? Architects, some argue, deal with volumes in space, and should leave digital media out of the equation. They are wrong, we think. The merging of digital and physical spaces leads to new social and spatial practices. This has a huge impact on spatial practices and spheres such as dwelling and inhabiting, meeting and public space, traveling and mobility, work and provisioning, and leisure. The design of these spatial domains has traditionally been the core business of architects and planners. Any changes in these fields therefore directly affect their work and cannot be ignored. Perhaps then, architects and planners should embrace new media and try to integrate the digital domain seamlessly into the design of physical space? Architects build for people, and if people want to use new media technologies, the architect should try to optimize their personalized media-experience of urban space. Architects should use the latest technologies to shape their designs. Spaces can be stuffed with sensors that make ‘smart’ analyses of the environment so that they can respond to changing circumstances. Surfaces can be conceived of as potential pixel space for interactivity, so that surroundings can be personalized and adapted by their users. This is the ‘information age’ and architecture should express that in any possible form. Architects should not only build for the streets, but also for the screen. This response is the exact opposite of ignoring. But isn’t this over-enthusiastic stance ignoring the fact that media practices are profoundly influencing social behavior in physical space, yet not necessarily always for the better? And what remains of the valuable differences between spatial design and media design? Or can spatial design professionals relate in a third way to the ubiquity of new media in the (urban) landscape? Can they find a space of their own which neither rejects nor fully embraces these developments? We propose they can, and should, by taking a stance of ‘critical engagement’. This proposition does not just mean taking a reconciliatory position somewhere in the middle of this – admittedly somewhat caricatural – spectrum between ignoring and embracing. The attitude of ‘critical engagement’ implies a self-reflective take on the profession of spatial design itself. For us – as relative outsiders with an interest in new media, urban culture and identity – architecture is foremost a discipline that provides spatial structures for social processes. It is a profession that literally sets the stage for the social interactions of everyday life. The main question architects should ask themselves is how new media technologies alter the social processes behind spatial interventions? For example, is housing still the same when the home is no longer a retreat with four walls and a roof, but penetrated by all sorts of media which bring in formerly separated domains like work, leisure, meeting, and even (virtual) travel? And inversely, to what extent does ‘habitation’ become mobile, invading other domains as people increasingly dwell in the familiarity of their mobile media devices and networks which they take anywhere they go? Media-technologies form a third leg in the traditional expertise of architecture: to shape social processes by means of physical interventions. Media practices turn this dyad into a triangular relationship: man + environment + media. Position 1 (ignore) emphasizes the relation between man + environment but ignores the fact that social processes in physical space are increasingly mediated by technologies. Position 2 (embrace) emphasizes the relation between man + media, yet loses sight of the importance of physical context for media use. Position 3 takes this triangular relationship as its point of departure. On the one hand architects have to come up with new design solutions for these changing social practices. On the other hand they can also influence these mediated social practices through physical design interventions: directing, discouraging, stimulating alternatives, commenting on them, and so on. Challenge 1: Who sets the normative framework? This makes architecture a highly normative discipline. Although architects cannot determine what happens in the spaces they design (and few if any still care to do so), they do set up a prescriptive environment that might invoke, encourage or prohibit particular interactions, experiences or moods. In our view this is no longer possible without at least some basic insights in the way digital media have made their way into the urban fabric and the practices of daily life. We realize that this design practice always has to carefully maneuver between multiple and often conflicting stakeholders and interests, intended activities and events, and the character of specific sites and contexts. Architects face difficult questions about their position in relation to clients and the people they design for, the proposed uses and activities of places, and the quality of space and environment. New media practices make this process of defining stakeholders, activities, and spatial context far more complicated. Why? More often than before new media practices involve stakeholders who are not physically present. Unforeseen uses and events may arise from new developments in media, like for instance ‘smart mobs’: gatherings of people coordinated by mobile media. And the definition of context and spatial quality is challenged by new media practices like ‘geotagging’ whereby people can inscribe places with digital representations and are able to do realtime database queries for related places. This is all quite abstract so let’s look at an example. Suppose an architect or planner is involved in designing some public space, say a park. Who are the stakeholders involved and what are their interests? What activities might take place there? What qualities should that public place have? The client, a local municipality, will want to combine a pleasant public service with some level of institutional control to prevent loitering, pollution, etc. The public may want a place were they can relax, but some also want a place to work and meet. The planner must find a position vis-a-vis the public’s wish for leisure and connectivity (e.g. by installing benches, free wireless internet, and electricity), institutional control (e.g. by somehow limiting access to wireless infrastructure, installing CCTV cameras, or uncomfortable benches that cannot be used long), and stimulating the public character of the park (e.g. by discouraging individual media consumption altogether). Moreover, the stakeholders do not solely consist of the municipality and a heterogeneous public, but also of the wireless internet provider, the technical repair staff, the security agency monitoring the park behind screens, and even theaters, cafés and shops in the vicinity that might be affected by the media-consumption and online buying habits of the now-connected public. Similarly, free wireless internet may shift the intended activities of the park from being a local public meeting place for co-existence towards a place for individualized networking on a potentially global scale. This in turn influences the quality of a park as a specific public setting. If people use Twitter and Facebook to post that they are in the park, will they be more likely to meet acquaintances or strangers there? Moreover, the representation and quality of the park may be largely outside of the planner’s hands when people upload and share their experiences of that place online. So, who exactly sets the design criteria, and the values they imply? Are architects to carry out the wishes of their clients? Do they play a part in shaping them in concordance with their clients? What role do external parties play, such as regulatory bodies? Should architects raise their voice in the broader public debate about the values they play a part in shaping or enforcing? A further challenge is the relation of the architect with the client. We are well aware that the design profession is to a large extent a ‘messy’ business, where ideals and actual practice more often than not diverge rather than run in parallel. How can an architect sell these stories about new media to a client who just wants a house, or a park? We realize that our argument is not just about convincing the architect of the necessity for ‘critical engagement’ with new media, but also about educating the client. This is an important issue for the future as well, not just for the architect but also for The Mobile City. Challenge 2: Control or open up? Another challenge that looms is simply not to get carried away by all the new possibilities and rhetoric of smart technologies. So far we have been talking about the design of social processes, yet one could argue that this is also a dangerous path. To what extent do architects really want to direct these social processes? What level of control does one strive for? Should architects – with the help of for environmental psychologists and security experts – design for a precisely prescribed specific effect? Or should the outcome left open? Should architects design open systems that can be adopted to multiple uses? We’d argue for the latter. The city should not be turned into a collection of friction-free non-places but rather continue to allow for what Mark Weiser has called ‘seamful’ experiences. We agree with Adam Greenfield’s suggestion (in an interview with The Mobile City) that it would be much better to merely provide ‘a service framework that is subtle and unobtrusive, yet robust and open enough so that people can reach in, grab it and use it’. Of course it can be an interesting proposal to try to ‘nudge’ behavior in a certain direction. Yet systems should be open enough to allow for unforeseen uses and adaptation by the public. This issue is particular important with regard to new media design in a spatial context. In many instances of urban computing, unspoken cultural codes or legal codes are hardened into software code. And where the soft systems of culture and even the code of law are somewhat malleable (officer, can you please make an exception? ), if a particular protocol on for instance who is allowed access or not is established in the soft- or hardware, one has to be (or hire) a hacker to get a temporary exception. These are also questions we will continue to pose to ourselves. One of the future aims of The Mobile City is to look for ‘best practices’ (or total failures) within the field of architecture itself, in order to learn from them, and be able to provide clearer answers. One of the things we noticed during this ‘Day of the Young Architect’ is that many architects appear to feel threatened by the new media realm which is encroaching upon their profession. New media which increasingly operate in physical contexts challenge architecture’s traditional monopoly in shaping social processes through the design of physical spaces. Yet we believe there are also new chances and opportunities for architects and planners. First, we already witness that the profession is flexibly adapting itself to new circumstances. Architecture is moving in the direction of what has been called ‘service design’. This means that a client hires a ‘designer’ not to just build him a beautiful building, but to shape a particular process or ‘customer (or ‘citizen’) experience’ from start to end. The question is how can these two structures – physical situations and media practices – be combined to design for urban experiences in meaningful ways? Surely this question cannot be solved by architects alone. Architects are increasingly working together with other professional disciplines, such as software engineers, sociologists, structural engineers, media theorists and philosophers. (See for instance Dan Hill’s talk with Carlo Ratti for an elaboration of this theme, and his recent response to the exhibition Toward the Sentient City). Depending on the assignment architects sometimes are but one of the players in such multidisciplinary teams, while sometimes they can take the lead. Second, architects harness spatial expertise that can steer future directions of new media. Digital media developments are increasingly being integrated with geographical space, physical context, and the material world (labelled geo-spatial web, locative media, the internet of things, and so on). We think it is important that architects play a role in the debate about the values that are implied in such media designs. As experts in what Dan Hill calls ‘spatial intelligence’, architects can contribute important insights to the discussions what directions new media developments should head. Architects might engage in methods of ‘critical design’, where the main aim of a project is to tease out the tensions, power relations and other issues at play in particular constellations of architecture, digital media and urbanism. So instead of feeling threatened by new media, why shouldn’t architecture boldly enter this field and enrich it with its own expertise? One example is ‘information architecture’ as a way to spatially represent complex information. The large majority of people think spatially. As datasets are growing in size and complexity there is a great opportunity for spatial professionals to manage and visualize digital information. Spatial design starts from particular goals and seeks different channels to engage stakeholders – ranging from interventions in space to the design of information services and the structuring of organizational processes. ‘Critical engagement’ with digital media, we feel, not necessarily translates into interventions in the physical city. Rather it should involve thinking about the city as a complex of social processes that are partly brought about by new media practices and partly by physical processes. This hybridization of the city – and its consequences for urban professionals – is something The Mobile City will continue to research and address. We believe this opens new opportunities for architects. Some may choose to pursue what they do best: the design of physical volumes and spaces –albeit as part of multidisciplinary teams perhaps led by ‘Master Designers’. Others might try to shape the design process at large themselves, a new incarnation of the idea of the ‘master builder’, and direct the process in which multiple disciplines come together. Whatever they choose, we are convinced that future architecture is at its best when it critically engages with digital media developments.